Theresa May has announced plans to boost Britain's investment in Africa after Brexit, during her first trip to the continent as prime minister. In a speech in Cape Town, she pledged £4bn in support for African economies, to create jobs for young people. She also pledged a "fundamental shift" in aid spending to focus on long-term economic and security challenges rather than short-term poverty reduction. She will also visit Nigeria and Kenya during the three-day trade mission. On her way to South Africa, the prime minister played down warnings from the chancellor about the economic damage a no-deal Brexit could cause. Talking to journalists on board RAF Voyager on Tuesday morning, Mrs May reiterated that she believed a no-deal Brexit was still better than a bad deal - adding no-deal "wouldn't be the end of the world". Last week Chancellor Philip Hammond warned in a letter that a no-deal Brexit could damage the economy. Mrs May's trip - which will see her meet the presidents of all three countries - aims to deepen economic and trade ties with growing African economies ahead of Britain leaving the EU in 2019. Arriving in South Africa on Tuesday morning, Mrs May said she wanted the UK to overtake the US to become the G7's biggest investor in Africa by 2022. She promised to continue existing economic links based on the UK's EU membership - including an EU-wide partnership with the Southern African Customs Union and Mozambique - after Brexit next year. Promising an extra £4bn in direct UK government investment - which she expects to be matched by the private sector - she said while the UK could not match the "economic might" of some foreign investors - such as China or the US - it offered long-term opportunities of the "highest quality and breadth". She defended the UK's aid spending in Africa, a target of criticism from some Tory MPs, saying it had "worked" to give millions of children and women an education and immunise millions against deadly diseases. But she said she was "unashamed" that it had to work in the UK's own interest and pledged a new approach in future, focusing on helping British private sector companies invest in fast-growing countries like Cote D'Ivoire and Senegal while "bolstering states under threat" from Islamist extremism such as Chad, Mali and Niger. "True partnerships are not about one party doing unto another, but states, governments, businesses and individuals working together in a responsible way to achieve common goals," she said. The UK's overseas aid budget totalled £13.9bn in 2017, an increase of £555m in 2016. UK direct investment in Africa was £42.7bn in 2016, compared with £44.3bn from the US, £38bn from France and £31bn from China, according to data from the United Nations Conference on Trade and Development. Theresa May is on a charm offensive. 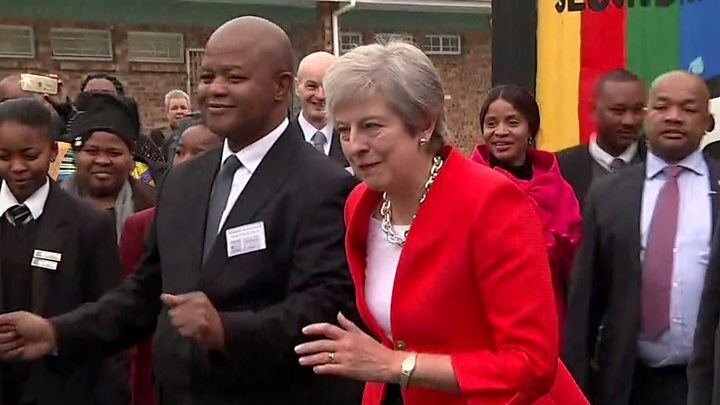 This is the first visit by a UK prime minister to South Africa in five years - the last visit was by David Cameron when he came for Nelson Mandela's memorial in 2013. But this trip was prompted by Brexit, as with the UK leaving the European Union next year, it needs to strengthen its trade agreements around the world. Mrs May's address to business leaders was peppered with flattery about the continent's potential, as well as noting concerns about challenges around security and poverty, and she promised a mutually beneficial relationship. But some say the UK is late to the trade party, with countries like China already having firm trade partnerships across Africa. Africa is changing, re-imagining itself and rejecting the label of the "dark continent". Many in South Africa, and indeed across the continent, will be keen to see how the UK, which has at times been criticised for being too focused on aid rather than trade, demonstrates its shift to seeing the continent as an equal partner at the table. Mrs May said national self-interest and global co-operation were not in conflict and the UK could play a key role in harnessing the "innovation and creativity" of young people in Africa, 60% of whose population is under the age of 25. "The challenges facing Africa are not Africa's alone," she said. "It is the world's interest to see these jobs created." Lord Boateng, chair of the Africa Enterprise Challenge Fund, praised the government's "proactive spirit" at making more opportunities for British business on the continent, but said the UK was "late to the party". He told BBC Radio 4's World At One: "The reality is that the Chinese, the French, the Indians, indeed Korea, Japan, Germany even, tend to have had a much more proactive response to business in Africa than we traditionally have had. "We have a lot of catching up to do if we are to make the most of what is an historic opportunity to recast the relationship between Africa and the UK away from it being seen solely as a philanthropic exercise, a basket case suitable only for [oversees aid], to an opportunity that requires investment, that requires risk taking and support by government for British companies." Sharon Constancon, chair of the South African Chamber of Commerce in London, said the UK's aims were ambitious given that it currently ranked seventh and eighth respectively in terms of exports and imports to South Africa, the continent's largest economy. During talks with South African President Cyril Ramaphosa, Mrs May said she raised the issue of his government's controversial land reform program, which has been criticised by US President Donald Trump - who last week claimed that white farmers were being murdered and their property expropriated. The UK PM said she supported measures that were legal, transparent and had democratic approval, welcoming Mr Ramaphosa's assurances there would be "no smash and grab" seizures of land. The UK's historical relationship with many African countries still counts for something, but, as Prime Minister Theresa May will find on her trip to the continent, the UK now vies for attention with larger economies offering greater riches. The continent's leaders need to decide who to prioritise: an ambitious but friendly China, the huge European Union bloc, the potential riches of the United States, or the historically-linked United Kingdom. The prime minister's trip comes a week before the huge Forum on China-Africa Cooperation in Beijing. Dozens of African heads of state are expected there and China may offer new trade and finance deals. Mrs May's trip seems rather low key in comparison. Tuesday - Mrs May flew into Cape Town where she met young people, before delivering a keynote speech on trade and how UK private sector investment could be brought into Africa. After a bilateral meeting with South African President Cyril Ramaphosa, she visited Robben Island, where Nelson Mandela was imprisoned for 18 years. She had a guided tour and was handed a key to open the cell Mr Mandela was imprisoned in, before writing in the guestbook: "His legacy lives on in the hopes and dreams of young people here in South Africa and around the world." Wednesday - Mrs May intends to meet Nigerian President Muhammadu Buhari in the capital Abuja before meeting victims of modern slavery in Lagos. Thursday - In Kenya, Mrs May will meet president Uhuru Kenyatta before visiting British troops and a business school. A state dinner hosted by Mr Kenyatta will conclude the trip.